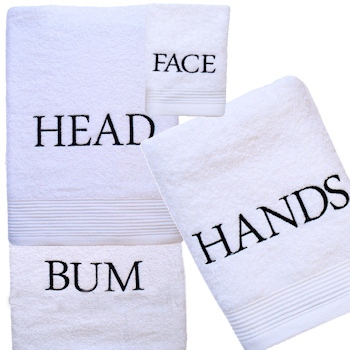 Fabulous 3 piece towel set embroidered with the intended uses to each towel. Fabulous 3 piece towel set embroidered with the intended uses to each towel. Head and Bum on each end of the bath towel, Hands on the hand towel, and Face on the face cloth. Your choice of thread colour and font style.